Guys! I finally got myself re-fitted for sneakers and it was WAY more involved than last time. A little background: I've been using the Brooks Ravenna 5 since October of 2013. It replaced a pair of Nike ProFits that worked pretty well but in which I occasionally succumbed to some knee pain. The Ravennas seemed to take care of that problem, and I used them happily for almost two years. Until the Ravenna 5 was phased out for the new 6 model. Sure, I could've just bought eighty pairs of 5s on clearance and hope my stash lasted me the rest of my running career; likewise, I could've just bought a pair of 6s and trusted they would rock. But I wanted more than that. I wanted to try on shoes! The past couple times I've had sneaker fittings they've taken place in a Fleet Feet. I probably would've gone back there but I happened to drive past a Road Runner Sports near work one day and figured I'd give it a try. I'm glad I did because their fit process is INSANE. 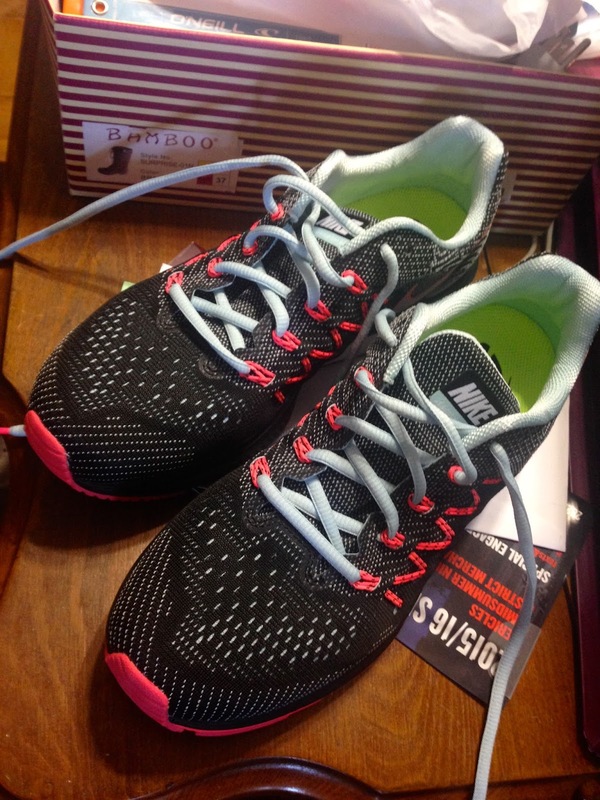 The process began with the help of Mesa, a fit expert who ran the technological side of what they call the Shoe Dog fit method. She did a lot of your standard stuff - asking me about my running habits, any problems, if I was training for anything, getting a shoe size. She also had me stand on some sort of pressure device that determined my pressure points (here I was complimented on my arches; Mesa said they were the highest she'd seen. FTW!). Things started heating up when she had me take off my shoes and hop on a treadmill - and a video camera recorded me running from behind. Mesa brought up the footage and slow-mo'd her way through my stride, showing me how my left foot stayed perfectly straight as it hit but my right turned inward just a bit. "I actually never would have put you in a stability shoe like a Ravenna," she said. MIND. BLOWN. 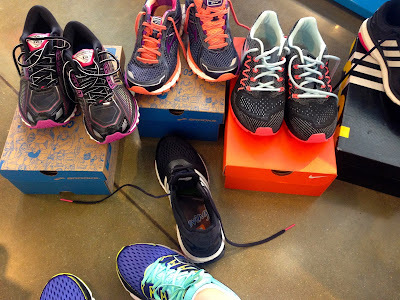 I tried a pair of Sauconys, two pairs of Brooks (Ghost and something else I don't remember), a pair of Adidas ("a wild card" according to Lee), Nike Zoom Vomero 10, and the Asics Nimbus, which really DOES feel like running on a squishy cloud. The Adidas and Saucony shoes were briefly in the running, but I ultimately found the former lacked bounce and the latter were too wide. That Nimbus squishiness tempted me, but there was something about the way the Nikes fit that felt right. Indeed, in a way sneakers had never felt right to me before, like they were made to hang out with my feet. I hadn't yet tried every brand in the store, which some might say is less than thorough (next time, Mizunos and Hokas! ), but that fit... what shoe dreams are made of, I tell you. I did get talked into one thing - a VIP membership. It does cost $20 but you get a minimum of 10% off for a year (that day I got 20% off due to a sales promotion). I am often suspicious of such programs but I'm sure I'll need at least one more pair of these in October for MCM, so I don't think it was a bad call. This may or may not be a good deal for you - take a moment to consider before you commit. One pack of socks later and I was out the door with my new Nike friends! As of this writing I have now run with my Zooms three times and I continue to be pleased with them. They feel good! They do - and will continue to for a bit - take some getting used to. Going from a stability shoe to a neutral shoe changes the requirements you're making of your muscles, so I am proceeding with caution. But very optimistic caution! I'm taking them on their first outdoor, real-terrain spin on Thursday morning. Wish me luck! When were you last fitted for running shoes? Have you ever switched brands unexpectedly?